You are here: Home / 4G LTE / Your Levi’s Stadium technology primer: Everything you need to know about wireless technology at the site of Super Bowl 50! With Super Bowl 50 two weeks away there is going to be increased interest about whether or not Levi’s Stadium in Santa Clara, Calif., host site of the event, is “the most technologically advanced” athletic venue. Here at Mobile Sports Report, we have spent the better part of the last two years researching and reporting on Levi’s Stadium and all its technical components, attending multiple events and compiling all the known statistics we can find, to present as complete and as honest an assessment as possible, from a completely objective perspective, about the technology found at Levi’s Stadium. So what’s our verdict? 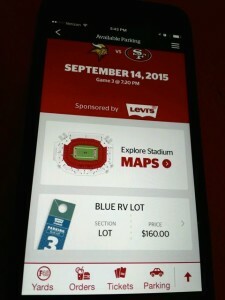 As we see it, there are three main features that set Levi’s Stadium aside from most others, and qualify it for consideration as one of the most technologically advanced large public venues: The stadium’s Wi-Fi network, its distributed antenna system, or DAS, and the integrated Levi’s Stadium app, which takes advantage of a large network of beacons to provide wayfinding and other location-based features. Though some of the components, like the Wi-Fi network, may not be the fastest or largest around, it’s our opinion that the sum of the parts puts Levi’s Stadium at or near the top of any well-connected stadium list; but the 2-year-old venue’s real test won’t come until Super Sunday, when we’ll all see if the networks, apps and personnel performance can live up to the stress of one of sport’s biggest events. For anyone who wants to know the exhaustive details behind the technology, we’ve included in this story links to all of our Levi’s Stadium stories we think are pertinent, to help other writers or interested sports-tech types get a grip on what’s really going to be technologically available to the 72,000 or so fans who show up on Feb. 7 to watch the NFL’s 50th annual big game. For starters, here is the first part of a feature we did at the start of the season about how Levi’s Stadium was getting ready for Super Bowl 50. Though we expect some more news next week about late additions, this article pretty much sums up the first-year performance and the tweaks the San Francisco 49ers made to their home-stadium’s wireless infrastructure. And here is the second part of the feature, which focuses more on the stadium’s excellent app, which we’ll talk more about later. 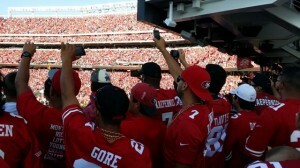 Fans take pictures at Levi’s Stadium, opening day 2014 season. Wi-Fi: It’s good, but is it the best? The Wi-Fi in the stadium is pretty good, among the best out there anywhere, but probably not the biggest or fastest network in all the land. Though the Aruba-gear network was innovative for its heavy use of under-seat Wi-Fi APs and the 1,200 APs it had for its first year, other stadiums are meeting or beating those numbers, and under-seat deployments are now becoming quite trendy for venues that want fast, wide connectivity. With slightly more than 1,200 APs now, the Levi’s Stadium Wi-Fi network has seen some big-traffic days for Wi-Fi, including the stadium’s NFL regular-season opener and a WrestleMania event last year. Among stadiums we’ve seen, AT&T Stadium in Arlington, Texas, has more Wi-Fi APs and is a bigger place (by about 30,000 in capacity for football) so it had more overall Wi-Fi traffic than Levi’s the past couple years. And Kyle Field’s new network down at Texas A&M is the fastest we’ve seen anywhere, and already has had a bigger Wi-Fi traffic day than Levi’s Stadium. And we haven’t yet visited Miami’s Sun Life Stadium but they get a lot of wireless traffic there too. So while Levi’s Stadium may be among the best, we’re not quite sure it is at the top of the list, at least when it comes to sheer Wi-Fi connectivity. For what it’s worth, Super Bowl XLVIII in MetLife Stadium used only 3.2 TB of Wi-Fi, so it will be interesting to see what happens with the growth curve at SB50. In addition to total data “tonnage” there is also an interesting observation about how much data is used per fan, on average. 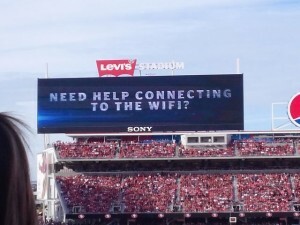 When we get the stats back from Super Bowl Sunday it will be interesting to see if the smaller crowd at Levi’s Stadium will have used more data per connected person, a good reflection of both the carrying capacity of the network and the ease of connecting and staying connected to the Wi-Fi. What is often confusing to non-tech types who try to write about stadium wireless is realizing that there are often two separate networks, Wi-Fi and cellular, operating in the same venue. While many fans actively seek out Wi-Fi, many game-day attendees either don’t bother or don’t know how to connect to Wi-Fi, and so just use their phones like they do anywhere else. To make sure they still have a strong signal, wireless carriers and venues often team up to deploy a distributed antenna system, or DAS, which is basically a bunch of small antennas located inside the venue that act just like a big cell tower, connecting phones to the nearest antenna. 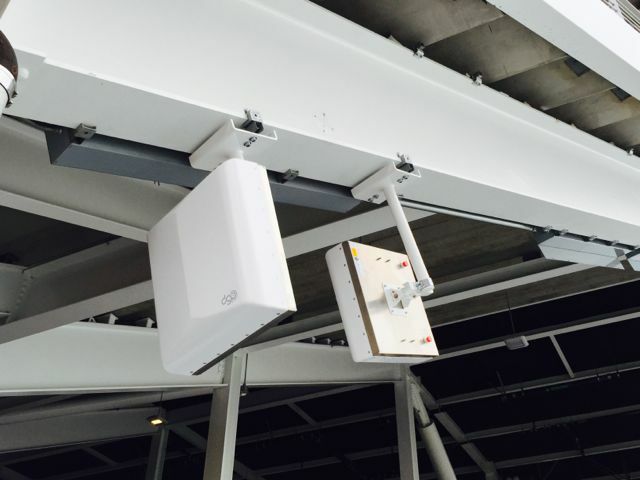 At Levi’s Stadium, integrator DAS Group Professionals (DGP) built a “neutral host” DAS for the stadium, which means the team owns the infrastructure and rents out space to carriers so they can connect to customers inside the building. One of the more interesting twists this past offseason was that DGP ripped out and replaced the entire DAS network it built the year before, at the behest of its customers, the major cellular providers. Why? According to DGP, the cell providers — who paid for the upgrade — are expecting as much as 2.5 times more cellular data at this year’s Super Bowl compared to last year, huge numbers that they were afraid might overwhelm the system installed in 2014. During a stadium tour this summer, MSR saw that the main Levi’s Stadium head end (where the telecom gear that connects the stadium to the outside networks lives) was being doubled in size, so by any stretch cell connectivity should be good if not great during the big game. DGP was also supposed to be increasing cell coverage outside the stadium in the parking lots, but so far we haven’t heard any reports if reception was better this year than last. At big events like the Super Bowl, the big wireless carriers will spend like crazy to make sure there are no reports of “phones not working,” so the DAS upgrades have become somewhat par for the course. AT&T said that it spent $25 million on wireless infrastructure improvements in the greater Bay area, including expanding its DAS operations inside Levi’s Stadium to allow them to handle 150 percent more traffic. You can expect that Verizon was spending some similar dollars, so rest assured, if you are there your phone will more likely than not find a signal. What will the app let you do? The biggest question remaining about the technological underpinnings of Super Bowl 50 — at least as of Sunday night — is whether or not all the features from the regular-season Levi’s Stadium app will make it into the mix for the Super Bowl, especially the one that really sets Levi’s Stadium apart, the ability to order food to be delivered to any seat in the stadium. Though we’ve been given a “head nod” that the service will be available for Super Sunday, we haven’t yet received any official notice of what’s going to be in the game-day app either from app provider VenueNext or the NFL. This season Niners fans at home games could not only order food and drinks for themselves, they could order and pay for food to be delivered to friends in the stadium, something we noted in our season preview of changes to the groundbreaking Levi’s Stadium app. If there is some doubt whether the league and the stadium might not make food-delivery available for the Super Bowl, it might have to do with the fact that at one of last year’s “big events” at Levi’s Stadium, the NHL’s Stadium Series outdoor hockey game, the food-delivery service melted down in the face of a massive amount of orders and a too-low level of human staffing. But our guess is that eventually (maybe this week?) we will hear that the Super Bowl app will embrace all the features of the regular Levi’s Stadium game-day app, including in-seat delivery. What many fans at the game may find even more useful is the app’s ability to provide wayfinding capabilities through a mapping feature that uses the 2,000+ Bluetooth beacons installed throughout the venue to provide live wayfinding, just like how Google Maps shows your car as a blue dot driving down the highway. With many attendees most likely visiting the stadium for the first time, having the ability to find your way around via your device may be the most welcome reason to download the app. Fans should also be able to watch in-stadium replays seconds after plays happen, and may also be able to watch Super Bowl broadcast commercials via their mobile device. Stay tuned for more “official” announcements of app capabilities as we hear them. In case you haven’t heard enough, here are a few more links from our in-person visits to Levi’s Stadium for Niners home games during the 2014 season. It would be nice to see some additional information besides Terabyte usage. Captures of Download/Upload speeds, number of clients, types of devices, etc. I am curious about the DAS systems that is/has been installed outside the stadium. I see a bunch of temporary cellular LTE towers have popped up around the stadium. If you read through our various stadium visits you will see a bunch of download/upload speed tests. And the DGP folks were supposed to upgrade the out of stadium network this summer, and AT&T and Verizon have put out recent press releases saying they’re also bringing in temporary towers as well.